For other uses, see Tecumseh (disambiguation). Tecumseh's father was Puckshinwa (in Shawnee, Puckeshinwau, meaning "Alights from Flying", "Something that drops" or "I light from flying", also known as Puckeshinwa, Pucksinwah, Pukshinwa, Pukeesheno, Pekishinoah, Pooksehnwe and other variations), a minor Shawnee war chief of the Kispoko ("Dancing Tail" or "Panther") band and the Panther Clan of the tribe. According to some sources, Puckshinwa's father was Creek and his mother was Shawnee. Either because his father died when he was young or because among the Creeks a husband lives with his wife's family, Puckshinwa was considered a Shawnee. According to John Sugden, however, "the truth about Puckeshinwau's ancestry must remain a mystery", and he reports further period testimonies stating that the Kispoko chief "was reputed to have had a British father (presumably a trader)". Tecumseh's mother was Methotaske (in Shawnee, Methoataaskee, meaning "[One who] Lays Eggs in the Sand" or "A turtle laying eggs in the sand", also known as Methoataske, Meetheetashe, Methotase and Methoatase), Puckshinwa's second wife. She is believed to have been Shawnee through her father and her mother, possibly of the Pekowi band and the Turtle Clan. Some traditions hold that she was Creek, because she had lived among that tribe prior to marriage; some hold that she was Cherokee, having died in old age living among that tribe; still others hold that she was a white captive, as family stories claim that Puckshinwa had been married to a white captive. Shawnee lineage was recorded paternally, which made Tecumseh a member of the Kispoko. At the time Tecumseh's parents married, their tribe was living somewhere near modern Tuscaloosa, Alabama. The tribe had lived in that region alongside the Creek tribe since being driven from their homes in the Ohio River Valley by the Iroquois (based in New York and Pennsylvania) during the 17th-century Beaver Wars. About 1759, the Pekowi band decided to move west into the Ohio Country. Not wanting to force his wife to choose between him and her family, Puckshinwa decided to travel north with her. The Pekowi founded the settlement of Chillicothe where Tecumseh was likely born. During the 1760s, Puckshinwa took part in the French and Indian War. The Shawnee were military allies with the British during the American Revolutionary War and repeatedly battled the Americans. Following his father's death, his family moved back to Chief Blackfish's nearby village of Chillicothe. The town was destroyed in 1779 by Kentucky militia in reprisal for Blackfish's attack on Boonesburough. His family fled to another nearby Kispoko village, but this was destroyed in 1780 by forces under the command of George Rogers Clark. The family moved a third time to the village of Sanding Stone. That village was attacked by Clark in November 1782, and the family moved to a new Shawnee settlement near modern Bellefontaine, Ohio. Violence continued on the American frontier after the Revolution as the Northwest Indian War. A large tribal confederacy, known as the Wabash Confederacy, which included all the major tribes of Ohio and the Illinois Country, formed to repel the American settlers from the region. As the war between the confederacy and the Americans grew, Tecumseh became a warrior and took an active part fighting along with his older brother Cheeseekau, an important war leader who essentially raised Tecumseh and Tenskwatawa after their parents' early deaths. Their older sister, Tecumapese, was also very important to their upbringing. In early 1789, Tecumseh traveled south with Cheeseekau to live among, and fight alongside, the Chickamauga faction of the Cherokee. Accompanied by twelve Shawnee warriors, they stayed at Running Water (in Marion County, Tennessee), where Cheeseekau's wife and daughter lived. There Tecumseh met Dragging Canoe, a famous leader who was leading a resistance movement against U.S. expansion. Cheeseekau was killed while leading a raid, and Tecumseh assumed leadership of the small Shawnee band, and subsequent Chickamauga raiding parties. Tecumseh returned to Ohio in late 1790. Afterward, Tecumseh took part in several battles, including that of the 1794 Fallen Timbers. The Indians were defeated by the Americans, which ended the Northwestern Indian Wars in favor of the Americans. Tecumseh eventually settled in what is now Greenville, Ohio, the home of his younger brother, Lalawethika ("He Makes A Loud Noise") who would later take the new name of Tenskwatawa ("The Open Door"). After difficult years as a young man who suffered from alcoholism, Tenskwatawa became a religious leader. Known as "The Shawnee Prophet", he advocated a return of the Shawnee and other American Indians to their ancestral lifestyle and rejection of the colonists and Americans. He attracted a large following among Indians who had already suffered major epidemics and dispossession of their lands. In 1805, Tenskwatawa led a religious revival following a series of witch-hunts following an outbreak of smallpox among the Shawnee. His beliefs were based on the earlier teachings of the Lenape prophets, Scattamek and Neolin, who predicted a coming apocalypse that would destroy the European-American settlers. Tenskwatawa urged natives to reject the ways of the Europeans: to give up firearms, liquor, European style clothing, to pay traders only half the value of their debts, and to refrain from ceding any more lands to the United States. The teachings led to rising tensions between the settlers and his followers. Opposing Tenskwatawa was the Shawnee leader Black Hoof, who was working to maintain a peaceful relationship with the United States. The earliest record of Tecumseh's interaction with the Americans was in 1807, when the US Indian agent William Wells met with Blue Jacket and other Shawnee leaders in Greenville to determine their intentions after the recent murder of a settler. Tecumseh was among those who spoke with Wells and assured him that his band of Shawnee intended to remain at peace and wanted only to follow the will of the Great Spirit and his prophet. According to Well's report, Tecumseh told him that the Prophet intended to move with his followers deeper into the frontier and away from American settlements. By 1808, due to increasing tensions with the encroaching settlers, Black Hoof demanded that Tenskwatawa and his followers leave the area. Tecumseh was among the leaders of the group, and helped decide to move further northwest and establish the village of Prophetstown near the confluence of the Wabash and Tippecanoe rivers (near present-day Battle Ground, Indiana). The site was in Miami tribe territory, and their Chief Little Turtle warned the group not to settle there. Despite the threat, the Shawnee moved into the region and the Miami left them alone. According to his brother's later account, Tecumseh was already contemplating a pan-tribal confederacy to counter American expansion into Indian-held lands. He was considered a natural and charismatic leader. Tenskwatawa's religious teachings became more widely known, as did his predictions on the coming doom of the Americans. His teachings attracted numerous members of other tribes to Prophetstown; they formed the basis of a sizeable confederacy of tribes in the southwestern Great Lakes region. Tecumseh emerged as the primary leader of this confederation, although it had started with warriors attracted by the religious appeal of his younger brother. Relatively few in confederacy were Shawnee; the confederacy was made up primarily of other tribes. Portraits of Pushmataha (left) and Tecumseh (right). The two principal adversaries in the conflict, Tecumseh and William Henry Harrison, had both been junior participants in the Battle of Fallen Timbers at the end of the Northwest Indian War in 1794. Tecumseh was not among the signers of the Treaty of Greenville that had ended the war and ceded much of present-day Ohio, long inhabited by the Shawnee and other Native Americans, to the United States. However, many Indian leaders in the region accepted the Greenville terms, and for the next ten years pan-tribal resistance to American hegemony faded. After the Treaty of Greenville, most of the Ohio Shawnee settled at the Shawnee village of Wapakoneta on the Auglaize River, where they were led by Black Hoof, a senior chief who had signed the treaty. Little Turtle, a War Chief of the Miamis, who had also participated in the earlier war and signed the Greenville Treaty, lived in his village on the Eel River. Both Black Hoof and Little Turtle urged cultural adaptation and accommodation with the United States. The tribes of the region participated in several treaties including the Treaty of Grouseland and the Treaty of Vincennes that gave and recognized American possession of most of southern Indiana. The treaties resulted in an easing of tensions by allowing settlers into Indiana and appeasing the Indians with reimbursement for the lands the settlers were squatting on. In September 1809, William Henry Harrison, governor of the newly formed Indiana Territory, negotiated the Treaty of Fort Wayne in which a delegation of Indians ceded 3 million acres (12,000 km2) of Native American lands to the United States. The treaty negotiations were questionable as they were unauthorized by the President and thus the United States government, and involved what some historians compared to bribery, offering large subsidies to the tribes and their chiefs, and the liberal distribution of liquor before the negotiations. Tecumseh's opposition to the treaty marked his emergence as a prominent leader. Although Tecumseh and the Shawnee had no claim on the land sold, he was alarmed by the massive sale as many of the followers in Prophetstown were Piankeshaw, Kickapoo, and Wea, who were the primary inhabitants of the land. Tecumseh revived an idea advocated in previous years by the Shawnee leader Blue Jacket and the Mohawk leader Joseph Brant, which stated that Indian land was owned in common by all. 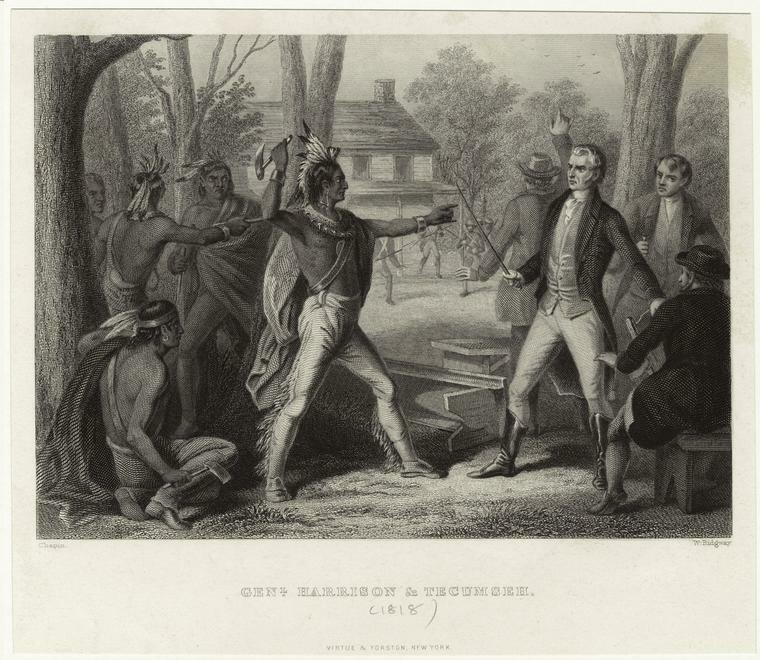 Tecumseh met with Indiana Governor William Henry Harrison to demand the rescission of land purchase treaties the US had forced on the Shawnee and other tribes. Harrison refused. In August 1810, Tecumseh led four hundred armed warriors from Prophetstown to confront Harrison at his Vincennes home, Grouseland. Their appearance startled the townspeople, and the situation quickly became dangerous when Harrison rejected Tecumseh's demand and argued that individual tribes could have relations with the United States, and that Tecumseh's interference was unwelcome by the tribes of the area. Tecumseh launched an impassioned rebuttal against Harrison. Tecumseh began inciting the warriors to kill Harrison, who responded by pulling his sword. The small garrison defending the town quickly moved to protect Harrison. Potawatomi Chief Winnemac arose and countered Tecumseh's arguments to the group, and urged the warriors to leave in peace. As they left, Tecumseh informed Harrison that unless he rescinded the treaty, he would seek an alliance with the British. In 1811, Tecumseh again met with Harrison at his home after being summoned following the murder of settlers on the frontier. Tecumseh told Harrison that the Shawnee and their Native American brothers wanted to remain at peace with the United States but these differences had to be resolved. The meeting had just a merely tentative character and both parties probably inferred from it that war was unavoidable. —Tecumseh's Speech at Tuckaubatchee, 1811. Despite Tecumseh's efforts, most of the southern nations rejected his appeals, and particularly Choctaw Chief Pushmataha, who stood fast and insisted upon adhering to the terms of the peace treaties that had been signed with the U.S. Government. However, a faction among the Creeks, who came to be known as the Red Sticks, answered his call to arms, leading to the Creek War. 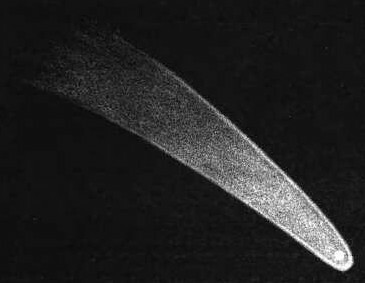 A comet appeared in March 1811. The Shawnee leader Tecumseh, whose name meant "shooting star", told the Creeks that the comet signaled his coming. Tecumseh's confederacy and allies took it as an omen of good luck. McKenney reported that Tecumseh claimed he would prove that the Great Spirit had sent him to the Creeks by giving the tribes a sign. If Tecumseh, soon after Vincennes’s meeting, got down to preparing for war, Governor Harrison got much farther. Having heard from his excellent intelligence that Tecumseh was far away, he sent this report to the Department of War: Tecumseh "is now upon the last round to put a finishing stroke upon his work. I hope, however, before his return that that part of the work which he considered complete will be demolished and even its foundation rooted up." Accordingly, Governor Harrison moved from Vincennes on September 26, 1811, with about 1,000 men in fighting trim, and marched on Tippecanoe. On November 6, 1811, Harrison's army arrived outside Prophetstown. The Prophet sent a messenger to meet with Harrison and requested a meeting be held the next day to negotiate. Harrison encamped his army on a nearby hill, and during the early dawn hours of November 7, the confederacy launched a sneak attack on his camp. In the Battle of Tippecanoe, Harrison's men held their ground, and the Indians withdrew from the village after the battle. The victorious Americans burned the town and returned to Vincennes. The Battle of Tippecanoe was a severe blow for Tenskwatawa, who lost both prestige and the confidence of his brother. Although it was a significant setback, Tecumseh began to secretly rebuild his alliance upon his return. The Americans soon after went to war with the British in the War of 1812, and Tecumseh's War became a part of that struggle. 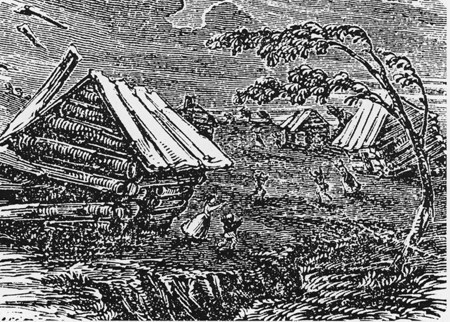 On December 16, 1811, the New Madrid Earthquake shook the South and the Midwest. While the interpretation of this event varied from tribe to tribe, one consensus was universally accepted: the powerful earthquake had to have meant something. For many tribes it meant that Tecumseh and the Prophet must be supported. Tecumseh rallied his confederacy and allied his forces with the British army invading the Northwest Territory from Upper Canada. He joined British Major-General Sir Isaac Brock in the Siege of Detroit, helping to force the city's surrender in August 1812. At one point in the battle, as Brock advanced to a point just out of range of Detroit's guns, Tecumseh had his approximately four hundred warriors parade out from a nearby wood and circle back around to repeat the maneuver, making it appear that there were many more warriors under his command than was actually the case. The fort commander, Brigadier General William Hull, surrendered in fear of a massacre should he refuse (and was later court-martialed for his actions). The victory was of a great strategic value to the British allies. The next British commander in the region, Major-General Henry Procter, wanted to honor Tecumseh for his help at the Siege of Detroit. He gave Tecumseh a sash, while offering him the rank of brigadier general in the British army. Tecumseh refused the commission and gave the sash away. The victory at Detroit was reversed a little over a year later. Commodore Perry's victory on Lake Erie late in the summer of 1813 cut the British supply lines. Along with William Henry Harrison's successful defense of Fort Miegs (creating a staging area for the recapture of Fort Detroit), the British found themselves in an indefensible position and had to withdraw from the city. They burned all public buildings in Detroit and retreated into Upper Canada along the Thames Valley. Tecumseh sought continued British support in order to defend tribal lands against the Americans. However, a much reinforced Harrison led an invasion of Canada. The next British commander, Major-General Henry Procter, did not have the same working relationship with Tecumseh as his predecessor and the two disagreed over tactics. Procter favored withdrawing into Canada and avoiding battle while the Americans suffered from the winter. Tecumseh was more eager to launch a decisive action to defeat the American army and allow his men to retake their homes in the northwest. Meanwhile, Harrison pursued the retreating British and allied tribes. When Procter's forces failed to appear at Chatham, Ontario (although he had promised Tecumseh that he would make a stand against the Americans there), Tecumseh reluctantly moved his men to meet up with Procter near Moraviantown. He informed Procter that he would withdraw no farther. He told Procter that if the British wanted his continued help then an action needed to be fought, and that they should await Harrison's army there. The despairing speech Tecumseh delivered before Procter, bitterly hinting at his weakness, concluded with these foreseeing words. On October 5, 1813, the Americans attacked and won a victory over the British and Native Americans at the Battle of the Thames, near Moraviantown. Tecumseh was killed, and shortly after the battle, most tribes of his confederacy surrendered to Harrison at Detroit. As to the actual circumstances surrounding Tecumseh’s death, "the Americans claimed that [he] was killed by Colonel Richard Johnson during a cavalry charge. But the Wyandott historian Peter D. Clarke wrote, after talking with Indians who had fought in the battle:"
Among the retreating Indians was a Potawatamie brave, who, on perceiving an American officer (supposed to be Colonel Johnson) on horse, close upon him, turned to tomahawk his pursuer, but was shot down by him with his pistol. […] The fallen Potawatamie brave was probably taken for Tecumseh by some of Harrison's infantry, and mutilated soon after the battle. Several of Harrison's army claimed to have killed Tecumseh. "I killed Tecumseh; I have some of his beard" one would say ; "I killed Tecumseh," another would clamour; "I have a piece of his skin to make me a razor strop !" none of these bragadocias [sic] were in the last battle, in which the brave Chief received his mortal wound. When it comes your time to die, be not like those whose lives are filled with the fear of death, so that when time comes they weep and pray for a little more time to live their lives over again in a different way. Sing your death song and die like a hero going home." "Brothers –the white people are like poisonous serpents: when chilled they are feeble and harmless, but invigorate them with warmth and they sting their benefactors to death." The United States Naval Academy in Annapolis, Maryland, has Tecumseh Court, which is located outside Bancroft Hall's front entrance, and features a bust of Tecumseh. The bust is often decorated to celebrate special days. The bust was actually originally meant to represent Tamanend, an Indian chief from the 17th century who was known as a lover of peace and friendship, but the Academy's midshipmen preferred the more warlike Tecumseh, and the new name persisted. Four ships of the United States Navy have borne the name USS Tecumseh. The first USS Tecumseh (1863), was a Canonicus-class monitor, commissioned on 19 April 1864. It was lost with almost all hands on 5 August, at the Battle of Mobile Bay. The second USS Tecumseh (YT-24), was a tugboat, originally named Edward Luckenbach, purchased by the Navy in 1898 and renamed. She served off and on until she was struck from the Navy list ca. 1945. The third USS Tecumseh (YT-273), was a Pessacus-class tugboat, commissioned in 1943 and struck in 1975. The fourth USS Tecumseh (SSBN-628), was a James Madison-class ballistic missile submarine, commissioned in 1964 and struck in 1993. The Canadian naval reserve unit HMCS Tecumseh is based in Calgary, Alberta. Tecumseh is honored in Canada as a hero and military commander who played a major role in Canada's successful repulsion of an American invasion in the War of 1812, which, among other things, eventually led to Canada's nationhood in 1867 with the British North America Act. Among the tributes, Tecumseh is ranked 37th in The Greatest Canadian list. An 1848 drawing of Tecumseh was based on a sketch done from life in 1808. Benson Lossing altered the original by putting Tecumseh in a British uniform, under the mistaken (but widespread) belief that Tecumseh had been a British general. This depiction is unusual in that it includes a nose ring, popular among the Shawnee at the time, but typically omitted in idealized depictions. A number of towns have been named in honor of Tecumseh, including those in the states of Kansas, Michigan, Missouri, Nebraska, Oklahoma, and the province of Ontario, as well as the town and township of New Tecumseth, Ontario, and Mount Tecumseh in New Hampshire. 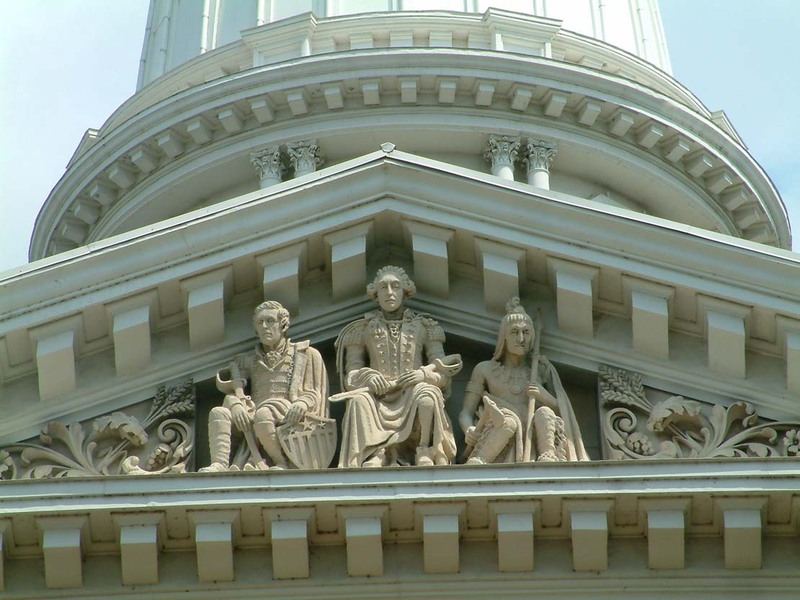 Tecumseh, along with the Marquis de Lafayette and William Henry Harrison is depicted in a pediment on the Tippecanoe County Courthouse (1882) in Lafayette, Indiana. The Royal Canadian Mint released a two dollar coin (Toonie) on June 18, 2012 and will release four quarters, celebrating the Bicentennial of the War of 1812. The second quarter in the series, was released in November 2012 and features Tecumseh. A twelve part comic book version of the Card novel. The cover of one of the issues of the comic book series was a copy of a painting of Tecumseh by John Buxton, which had been commissioned by the Heritage Center of Clark County, Ohio. The outdoor drama Tecumseh! is performed near Chillicothe, Ohio, and was written by novelist/historian, Allan W. Eckert. Tecumseh was a featured character in The Battle of Tippecanoe Outdoor Drama held in Battle Ground, IN in the Summers of 1989 and 1990. The poem "Live Your Life", allegedly composed by Tecumseh (but also ascribed to some of the Wabasha chiefs, Sitting Bull, Crazy Horse and Wovoka) was featured in the closing moments of the 2012 film Act of Valor. Tecumseh (played by a Serbian actor Gojko Mitić) appears as the primary character in the 1972 East German Red Western motion picture, Tecumseh. Actor Michael Greyeyes portrayed Tecumseh in the 2009 documentary film We Shall Remain. Ann Rinaldi's 1997 novel, The Second Bend in the River, depicts a fictionalized version of a romance between Tecumseh and Rebecca Galloway. Orson Scott Card's novel, Red Prophet, featured Tecumseh (named Ta-Kumsaw). Mimi Malenšek's 1959 Slovene historical novel, Tecumseh: Indijanska kronika (Ljubljana, 303 pp.). James Alexander Thom's historical novel, Panther in the Sky, is a novelized biography of Tecumseh. Fritz Steuben Tecumseh-Reihe, Franckh'sche Verlagshandlung, Stuttgart 1930-1939. Allan W. Eckert's "Winning of America" series, volumes The Frontiersman, Wilderness Empire, The Conquerors, The Wilderness War, Gateway to Empire and Twilight of Empire. Mary Oliver's American Primitive includes poem "Tecumseh". In Blood of Tyrants, the eight novel Namoi Navok's Temeraire series, Tecumseh is revealed to be the President of the United States defeating Alexander Hamilton. A life size statue of Tecumseh is featured in the sitcom Cheers. Insurance company executive Randall tries to quote Tecumesh in the Mad Men season six episode, "The Flood". In greeting Roger Sterling and the SCDP creative team hello and goodbye, Randall raises his hand in a stereotyped Native American gesture associated with "How"; this gesture is also a military greeting. Valkyries Acacia and Tamsin name-drop Tecumseh while reminiscing about past battles in which they had been involved, in Lost Girl, Episode 45 (Season 3). ↑ J. M. Bumsted (2009). The peoples of Canada: a pre-Confederation history. Oxford U.P.. p. 244. ISBN 9780195431018. http://books.google.com/books?id=pfMMAQAAMAAJ. ↑ 2.0 2.1 Allen, Robert S (2009). "Tecumseh". The Canadian Encyclopedia > Biography > Native Political Leaders. Historica-Dominion. http://www.thecanadianencyclopedia.com/index.cfm?PgNm=TCE&Params=A1ARTA0007898. Retrieved 2009-10-03. ↑ 3.0 3.1 "shawnee-traditions.com - The Family of Tecumseh & Tenskwatawa". Noel Schutz. http://www.fantasy-epublications.com/shawnee-traditions/Genealogy/Tecumseh_Family/Lineage.html. Retrieved November 14, 2011. ↑ In particular by Anthony Shane, a mixed-blood who spent most of his life in Shawnee towns, and by his wife Lameteshe, one of Tecumseh's kindred. ↑ "Birthplace of Tecumseh Marker". The Historical Marker Database. http://www.hmdb.org/marker.asp?marker=14064. Retrieved November 14, 2011. ↑ 10.0 10.1 David Wallechinsky and Irving Wallace (1975–1981). "Famous Native Americans: Tecumseh Part 1". The People's Almanac series of books. http://www.trivia-library.com/a/famous-native-americans-tecumseh-part-1.htm. Retrieved 2010-05-08. ↑ "Shawnee." Encyclopedia of North American Indians. Boston: Houghton Mifflin, 1996. History Study Center. ↑ William R. Carmack (1979). Indian Oratory: A Collection of Famous Speeches by Noted Indian Chieftains. University of Oklahoma Press. p. 73. http://books.google.com/books?id=eVoJgTzCyRYC&pg=PA73. ↑ Turner III, Frederick (1978) . "Poetry and Oratory". The Portable North American Indian Reader. Penguin Book. pp. 246–247. ISBN 0-14-015077-3. ↑ Treaty with the Delawares, Etc., 1809. Indianapolis: Indiana Historical Bureau. ↑ Steinberg, Theodore. Slide Mountain or The Folly of Owning Nature. Chapter 5, "Three-D Deeds: The Rise of Air Rights in New York" University of California Press, 1996. ↑ Turner III, Frederick (1973). "Poetry and Oratory". The Portable North American Indian Reader. Penguin Books. pp. 245–246. ISBN 0-14-015077-3. ↑ Bunn, Mike; Clay Willams (1811, 2008). "Original Documents, Excerpt from Tecumseh's Speech at Tuckaubatchee". Battle for the Southern Frontier. The History Press. p. 163. ISBN 978-1-59629-371-7. ↑ Battlefield Biker (2006–2008). "Shawnee Chief Tecumseh Delivers War Speech to Creek Indians at Tuckabatchee, Alabama in October 1811". Battlefield Biker. http://battlefieldbiker.com/Shawnee-Chief-Tecumseh-Delivers-War-Speech-to-Creek-Indians-at-Tuckabatchee-Alabama-in-October-1811. Retrieved 2010-10-03. ↑ 31.0 31.1 The King of Great Britain. ↑ Quoted by Reed Beard, The battle of Tippecanoe: historical sketches of the famous field upon which General William Henry Harrison won renown that aided him in reaching the presidency; lives of the Prophet and Tecumseh, with many interesting incidents of their rise and overthrow. The campaign of 1888 and election of General Benjamin Harrison, Tippecanoe Pub. co., 1889 (the 1911 edition has been digitized by the Internet Archive with funding from Microsoft Corporation and is accessible online in archive.org). ↑ Burton, Pierre (1980) The Invasion of Canada. Toronto: McClelland and Stewart, pp. 177-182. ↑ Whicker, John Wesley (December 1922). "Tecumseh and Pushmataha". Indiana University Department of History. pp. 315–31. JSTOR 27786040. ↑ Langguth, p. 206. Not all tribes, however, resigned themselves to surrendering, and among them most of the 'diehard' Kickapoos that had followed Tecumseh to Canada. In August 1816 over 150 of them were still living in the Prophet's settlement at Amherstberg and continuing their private war on the United States. Not until 1819 did the entire Canadian band return southwards (Gibson, Arrell Morgan (1963). The Kickapoos: Lords of the Middle Border. Norman, Oklahoma: University of Oklahoma Press, 1963, pp. 72-73. ISBN 0-8061-1264-6). ↑ It was just after a campaign based on the slogan "Rumpsey Dumpsey, Rumpsey Dumpsey, Colonel Johnson killed Tecumseh", that Johnson became Vice President of the United States, in 1836, to serve with Martin Van Buren; as the sole case in U.S. history, he fell short of the electoral votes needed to secure his election in the first instance, and had to get later appointed by the Senate (editor's note). ↑ Hamilton, Charles (ed) (1950). Cry of the Thunderbird; the American Indian's own story. New York: Macmillan Company, p. 162. ↑ Spencer C. Tucker (2012). The Encyclopedia Of the War Of 1812. ABC-CLIO. p. 837. http://books.google.com/books?id=VljA5QEI9_wC&pg=PA837. ↑ Welland Tribune (Article ID# 2803886). ↑ "Tecumseh-Harrison Elementary". Vincennes Community School Corporation. http://www.vcsc.k12.in.us/th/index.htm. Retrieved January 28, 2013. ↑ "Tecumseh Public Schools Home Page". Tecumseh (Michigan) Public Schools. http://www.tps.k12.mi.us/web/index.html. Retrieved January 28, 2013. ↑ "Tecumseh Middle School". Tecumseh (Oklahoma) Public Schools. http://tms.tecumsehschools.org/. Retrieved January 28, 2013. ↑ "Tecumseh Elementary School: About Us: Who was Tecumseh?". Vancouver School Board. http://go.vsb.bc.ca/schools/tecumseh/About/Pages/Our-School-Name.aspx. Retrieved January 28, 2013. ↑ "Tecumseh Public School". Halton District School Board. http://www.hdsb.ca/Schools/Pages/TecumsehPublicSchool.aspx. Retrieved January 28, 2013. ↑ "Tecumseh Senior Public School". Toronto District School Board. http://www.tdsb.on.ca/schools/index.asp?schno=4735. Retrieved January 28, 2013. ↑ "Canada's Coins". http://members.shaw.ca/kcic1. http://members.shaw.ca/kcic1/coins8.html. Retrieved October 28, 2012. ↑ Historical Overview, The Battle of Tippecanoe Outdoor Drama 1990 Souvenir Program, Summer 1990. ↑ Ernest Thompson Seton, The Gospel of the Red Man: An Indian Bible, San Diego, The Book Tree, 2006, p. 60 (ISBN 978-1-58509-276-5). ↑ Galloway, William Albert. Old Chillicothe. Xenia, OH: The Buckeye Press, 1934. ↑ Alan Sepinwall (April 28, 2013). "Mad Men: The Floor - He had a dream". http://www.hitfix.com/whats-alan-watching/review-mad-men-the-flood-he-had-a-dream. ↑ "Indian Greetings". http://answers.google.com/answers/threadview?id=426926. Retrieved 30 April 2013. Langguth, A. J. (2006). Union 1812:The Americans Who Fought the Second War of Independence. New York: Simon & Schuster. ISBN 0-7432-2618-6. Owens, Robert M. (2007). Mr. Jefferson's Hammer: William Henry Harrison and the Origins of American Indian Policy. Norman, Oklahoma: University of Oklahoma Press. ISBN 978-0-8061-3842-8. http://books.google.com/books?id=bKWrfrjrLEUC&printsec=frontcover&dq=Mr.+Jefferson%27s+Hammer:. Baym, Nina, Robert S. Levine, and Arnold Krupat. The Norton Anthology of American Literature; Vol. A. New York: W. W. Norton &, 2007. Print. Drake, Benjamin. Life of Tecumseh and of His Brother the Prophet; With a Historical Sketch of the Shawanoe Indians. (Mount Vernon: Rose Press, 2008). Edmunds, R. David (1983). "Tecumseh, The Shawnee Prophet, and American History: A Reassessment". pp. 261–76. Digital object identifier:10.2307/969620. JSTOR 969620. Gilbert, Bil. God Gave us This Country: Tekamthi and the First American Civil War. New York: Atheneum, 1989. Green, James A., "Tecumseh," in Charles F. Horne, ed., Great Men and Famous Women, vol. 2: Soldiers and Sailors, 308. New York: Selmar Hess, 1894. Pirtle, Alfred. (1900). The Battle of Tippecanoe. Louisville: John P. Morton & Co./ Library Reprints. p. 158. ISBN 978-0-7222-6509-3. http://books.google.com/books?id=YvA7AAAAMAAJ&pg=PR1&dq=Pirtle,+Alfred.+(1900).+The+Battle+of+Tippecanoe. as read to the Filson Club. Valencius, Conevery Bolton. The Lost History of the New Madrid Earthquakes. The University of Chicago Press, 2013. ISBN 978-0-2260-5389-9. Chapter 3, "Earthquakes on Native Ground"
Rugeley, Terry (1989). "Savage and Statesman: Changing Historical Interpretations of Tecumseh". pp. 289–311. http://webapp1.dlib.indiana.edu/imh/view.do?docId=VAA4025-085-4-a01. Wikimedia Commons has media related to Tecumseh. Beach, Chandler B., ed (1914). "Tecumseh". The New Student's Reference Work. Chicago: F. E. Compton and Co.